We offer 4 kits: The Grab ‘N’ Go Goody Box, The Summer Body Kit, The Active Pack & The Breakfast Bundle. Here, we highlight the key differences between the 4. The perfect kit if you struggle to make time for meals. Contains Breakfast shake, Shake Complete, shaker bottle and stainless steel rose gold water bottle. You can replace up to 2 meals per day using this kit. Perfect for: Busy lifestyles, people who don’t have time for meals, people wanting to replace 2 meals for healthy, nutritious alternatives. The best kit for weight loss and maintenance. Contains Breakfast shake, Sculpting Protein Shake, HotSlim, Hunger Fix and shaker bottle. Contains low-calorie products which help to keep you feeling full whilst ensuring you are still getting essential nutrients to stay healthy. A great kit for those who lead an active lifestyle. Contains Breakfast shake, Sculpting Protein Shake, HotSlim, shaker and HotSlim mug. Can be used to replace 2 of your meals per day and 1 snack replacement. A great companion to your workouts. A great little bundle for those who struggle with having breakfast. This kit contains Breakfast shake, Chia & Coconut Porridge and a shaker. It contains 2 different breakfast options for variety. 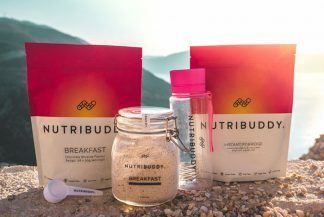 Previous post: I am a Coeliac / Gluten / Wheat / Barley Intolerant – can I take Nutribuddy products?